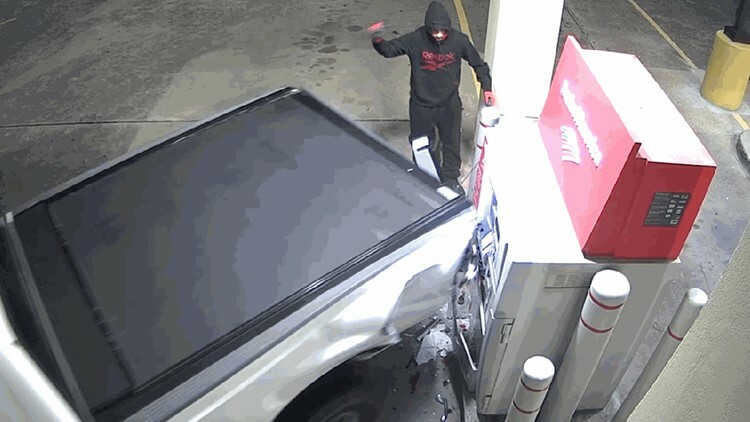 Police say the suspects used a stolen truck to ram the ATM until it fell over. They then tried to pry it open before speeding away in another stolen truck. HOUSTON — Houston Crime Stoppers hopes someone will recognize the men responsible for a destructive failed ATM heist in southwest Houston. The suspects are wanted for felony criminal mischief after their crime was caught on video. The crime happened shortly before midnight the evening of Jan. 29, according to the Houston Police Department. Three men attempted to burglarize the ATM in the 7500 block of Fondren. Police say the suspects used a stolen truck to ram the ATM until it fell over. The suspects, one wearing a hard had and safety glasses, then tried to use a pry bar to try and open the machine. Despite their efforts, the suspects quickly gave up and fled the scene in a second pickup truck, which police say was also stolen. The ATM was severely damaged during the incident. Crime Stoppers will pay up to $5,000 for information leading to the charging and/or arrest of the suspects in this case. Call 713-222-TIPS (8477) or visit www.crime-stoppers.org.